​Many pet owners feel grain-free drypet foodsare healthy and have a lot of nutritional value. In addition, grain-free dog food is much more palatable to dogs. You don’t expect your pet to be excited by a diet that has grains—it does not work that way. Why? Well, generally, dogs are carnivorous and this is the reason the number of grain-free dry dog food products is increasing. Also, human specialty diets such as gluten-free and paleo are becoming very popular. The idea here is that grain-free foods are good for us so they should also be good for your pet. However, let’s get one thing clear: just because your pet’s food is grain-free does not mean it is the best diet. Your pet still needs a considerable amount of fats, healthy carbohydrates, and proteins. The pet food industry is booming and currently, there are many grain-free drydog food brands. Fortunately, you do not have to go through each one of them to find the best for your pet. We have put together a guide on the things to look for when shopping for pet food and the top-rated best dry dog foods. If you visit your local pet food store, you will find many pet food brands labeled as “grain-free.”This can be frustrating because you are not sure which brand to buy. The purpose of this guide is to inform you on how to choose and buy grain-free dry dog food for your pet. Some of the things to think about include whether your pet really needs grain-free dry dog food and whether he is likely to be allergic to this kind of food. You also need to understand the characteristics of a well-balanced, grain-free dry dog kibble. Does Your Pet Need Grain-Free DryDog Food? 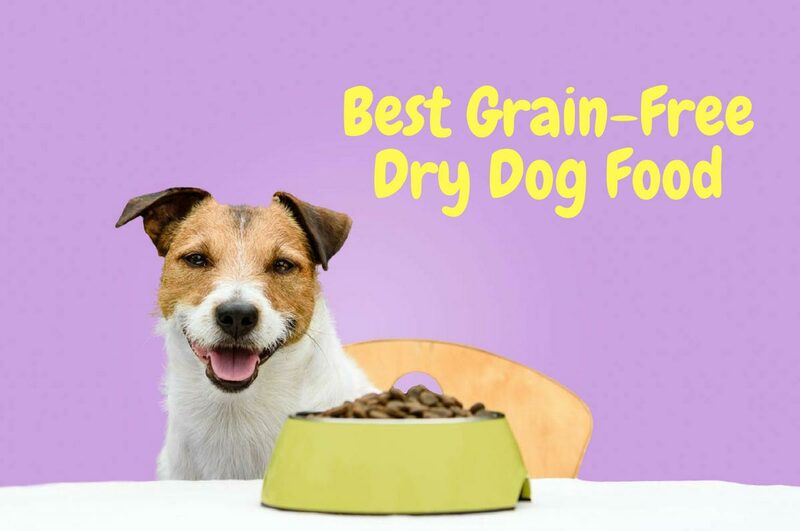 This is an important question to ask, especially because there are many commercials shouting out loud the importance of grain-free dry dog food for your pet’s health. Most pet owners believe gluten-free diets are important for dogs because they seem to do us a lot of good. So, let’s have a look at why people feel grain-free dry dog kibble is the way to go. Dogs are not entirely carnivorous. Actually, cats make better carnivores than dogs. Dogs, being members of the canid family, are omnivorous and they can survive by preying on other animals or plants. Thus, thinking that dogs are complete carnivores is a huge mistake. However, given a choice between an animal-based meal or a plant-based diet, dogs tend to favor the former. If you remove animal-based meals from your pet’s diet, he will still eat plant-based foods. Despite the fact that scientists have refuted this reasoning, many pet owners still think cereals are the cause of most food-related allergies in dogs. Unfortunately, just like the assumption that dogs are entirely meat-eaters, this is also wrong. Amylase is an enzyme that helps to break down carbs into starch. Once starch is formed, it’s sent to the stomach for further digestion. However, amylase is only found in human saliva but not in that of dogs. This is why most people prefer not to feed grains to their dogs because they can’t digest it properly. If this were the case, your pet shouldn’t eat all other types of carbs—not just grains. Nevertheless, dogs consume fruit and vegetables on a regular basis. ​​This dog food is considered the best, as it’s one of the most hypoallergenic dog foods available. One of its ingredients is high-quality protein obtained from good quality sources. The animal-based protein used in this dog food does not come from ordinary meats found in other dog food products. This is the secret behind its hypo allergic quality. Taste of the Wild shares the same sentiments as the rest of the pet owners’ community: if you feel that grain-free dog food is the best for your pet, you should eliminate other allergenic products from her diet as well. 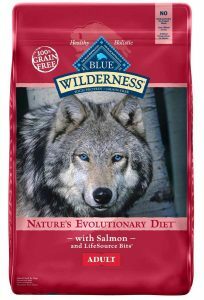 As a result, the Taste of the Wild formula has protein from animals such as boar, bison, salmon, and wild wolf. Each brand of dog food from TOTW has a high protein content, low fat, and moderate numbers of carbs. A pack of Taste of the Wild also contains a high quantity of anti-inflammatory and antioxidants, together with omega-3 and omega-6. And that’s not all!A bag of TOTW also includes probiotics to improve his digestion. 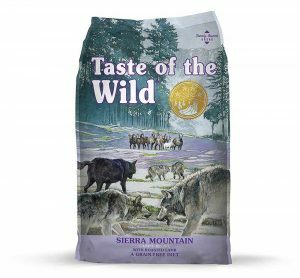 If you are looking for an all-around, dry dog kibble that is grain free, then Taste of the Wild is just the high-quality dog food for your pet. Natural Grain-free dry dog food follows closely behind Test of the wild. That said, Wellness CORE missed the bulls-eye because one of its many variants uses chicken as an ingredient. Fortunately, its original Turkey and Chicken brand has an additional fowl that effectively lowers the allergenic nature of proteins from chicken. If you are looking for one of the best hypoallergenic products for your pet, consider Wellness CORE’s variants such as duck, boar and rabbit, herring, and salmon and whitefish. The proteins in this food are of high quality and do not cause any allergic reactions. One of the reasons wellnessCORE is a winner is its formula? The list of ingredients includes glucosamine and chondroitin, two well-known elements that help to promote joint development. They also help in reducing symptoms linked to arthritis and hip dysplasia. If your pet suffers from joint or agility problems, try some Wellness CORE and watch him transform into a healthy pet. Plus, your pet also gets four different strains of bacteria (all friendly to the gut), whichwill boost his immunity. 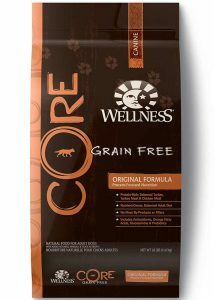 Although Wellness CORE does not have allergenic cereal grains, it has plenty of carbohydrates to help kick-start your pet’s day. ​​Also known as LifeSource, BLUE Wilderness is a unique brand of dog food as it is manufactured with its own set of proprietary ingredients. Each portion of high protein dog food comes packed with the correct quantity of vitamins and minerals to promote oxidative equilibrium in your pet’s system. However, be sure to go for salmon and duck only because these varieties help to compensate for the absence of hypo-allergic content in your pet’s diet. With protein content second to that of Wellness CORE, this dog food is a great choice for puppies because these little pets need protein to grow properly. 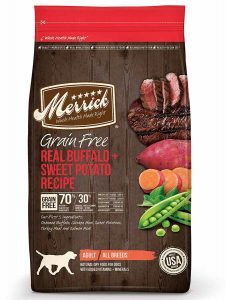 ​If you are looking for dog food with very high protein content but without soy, wheat, or corn, Merrick’s grain-free dog food is your best bet. More than 38 percent is dry matter and its protein content is from novel sources such as Venison, buffalo, rabbit, salmon, lamb,and duck. On the flip side, it has chicken and beef. The best thing about this brand is that you can choose to buy variants that don’t have chicken or beef. In addition, your pet also gets omega-3 and 6, both of which help to improve the anti-oxidant and anti-inflammatory activities of the immune system. Essentially, Merrick combines high-quality ingredients found in Wellness CORE and Taste of the Wild. Some pets, for one reason or another, suffer from kidney problems. As a result, it’s difficult for them to eat properly like other healthy pets. 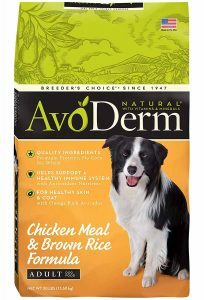 Fortunately, Avoderm developed this dog food specifically for pets with kidney problems. Of all the dog foods we have listed here, this particular brand has the lowest protein (23%). It has low-fat content, as well, and its ingredients come from potatoes, peas, and avocados. Ultimately, there is no downside to this dog food. It has chicken, beef, and chicken meal recipes. If you really want to stay away from allergens, purchase its salmon or lamb &rice variants. They contain wholesome and healthier grains such as oatmeal, brown rice,and bran. These ingredients have a lot of amino acids that can help in tissue growth and development. The main ingredient that sets this food apart from the rest is avocado. There are very many nutrients in avocado and this explains why it is now considered a superfood. Dog food with avocado has a high nutritional profile compared to other grain-free dry dog foods. If you want to improve your pet’s overall health, consider feeding him some AvoDerm. ​​Are Dogs Allergic to Grains? The reason pet owners prefer grain-free dog food is because they believe grains cause allergies in dogs. However, just how do allergies occur? Allergies help organisms protect themselves from foreign bodies like viruses or bacteria. The body’s defense releases immunoglobulin because of the presence of allergens. When the defense mechanism meets an allergen for the first time, special cells destroy it while other similar cells replicate the identity of this threat so that defensive cells are put on the alert in case the same allergen appears again. If the same allergen is detected a second time, the body will be able to fight it off because it was ready. Essentially, this is what is known as an allergy. Yes, there are dogs that are allergic to grains but they are also allergic to animal proteins such as beef or chicken. If food allergies gives you sleepless nights, then you should also get rid of the other allergens other than grains. Here is the thing, not all cereal grains cause allergies in dogs. In fact, most grains are wholesome like oatmeal, white and brown rice, amaranth, and millet. So, the term “grain-free” is misleading because it assumes that all grains are allergens. If you are looking for grain-free dry dog food for your pet, be sure to read and understand the labels that come with dog food packaging. Dog food labels that read grain-free should state categorically which grains they have excluded. Grain-free dog food is not about the presence or absence of allergenic grains. Rather, it has something to do with the wholesomeness of elements that make up your pet’s food. Here are a few elements of a quality grain-free dry dog food. Quality grain-free dog food has whole animal protein as the main element. Animal protein digests easily and is quickly absorbed into the cells. While your pet also consumes plant-based proteins, they take too long to break down. If you chose to buy animal-based protein for your pet, be sure to purchase novel brands or products with little allergenic potential. Not all grains are allergenic. Therefore, try to include wholesome grains in her diet because most come with essential acids and many other important nutrients. Also, find brands that include fruit or vegetables in their ingredients as these have many vitamins beneficial to your pet. Most dog foods have additives to enhance flavor and increase palatability. There is no problem if a dog food has additives; however, they must come from natural sources. Unfortunately, natural additives increase the cost of production for pet food companies. Therefore, many companies prefer to use artificial additives to improve the quality of dog food. Be sure to check the labels before you settle on kibble for your pet. Some of these artificial ingredients can be harmful to the health of your dog. Feeding your pet human-grade dog food or grain-free dry pet foods is perfectly fine as long as it gives you a peace of mind. After all, you are only looking out for your pet, who also happens to be a member of your family. Nevertheless, if you choose a grain-free diet for your pet, ensure it has sufficient nutrients from high-quality sources so that your pet can grow healthy and strong. 2 Does Your Pet Need Grain-Free DryDog Food? 5 ​​Are Dogs Allergic to Grains?